Thanks to my dearest friend Regina for another one of her spectacular recipes. 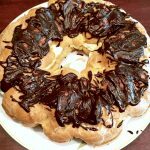 This classic cream puff cake is so decadent and delicious yet easy to make it’s a must to try and enjoy! A message from Regina: This one is a keeper! I tasted this unique cake at a recent office party and immediately asked for a copy of the recipe. I knew my family would absolutely love it! So the very next gathering I went to, I made it and the cake was devoured in minutes. Well, my family did not act fast enough and still has not had a chance to try the cake, but will very soon. Preheat oven to 400 degrees. Lightly grease and flour a large cookie sheet. Use a 7 inch plate to trace a circle in the flour on the cookie sheet. Combine water, butter and salt in a 2 quart sauce pan and cook over medium heat until butter melts and mixture boils. Remove saucepan from heat and add the flour all at once. Quickly stir until mixture forms a ball and pulls away from the sides. Add eggs into hot flour mixture one at a time, beating well after each addition. Mixture will become smooth and satiny. Cool slightly. On the prepared cookie sheet drop batter by heaping tablespoons into 10 mounds inside the circle to form a ring. Bake 40 minutes or until golden brown. Turn oven off and let cake remain in the oven for 15 minutes more. Remove cake from oven and cool on wire rack. When the cake is cool use a long serrated knife to slice it in half horizontally. Spread the filling evenly on the bottom layer of the cake, then replace the top. Refrigerate. Mix the pudding mix with the milk. In a separate bowl combine the heavy or whipping cream with the vanilla and powdered sugar. 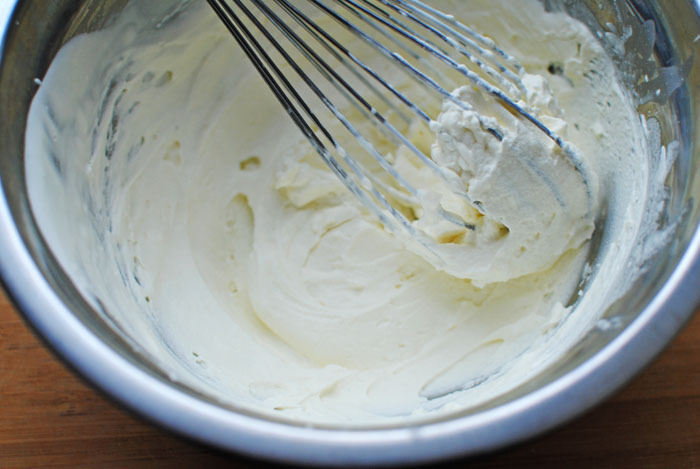 Whip together until thickened. Fold the whipped cream mixture into the pudding. Spread the filling evenly on the bottom layer of the cake, then replace the top. Refrigerate while getting the glaze ready. In a double boiler heat all glaze ingredients. Stir until smooth and shiny. Spread over cake and serve! 1.Preheat oven to 400 degrees. Lightly grease and flour a large cookie sheet. Use a 7 inch plate to trace a circle in the flour on the cookie sheet. 2.Combine water, butter and salt in a 2 quart sauce pan and cook over medium heat until butter melts and mixture boils. Remove saucepan from heat and add the flour all at once. Quickly stir until mixture forms a ball and pulls away from the sides. 3.Add eggs into hot flour mixture one at a time, beating well after each addition. Mixture will become smooth and satiny. Cool slightly. 4.On the prepared cookie sheet drop batter by heaping tablespoons into 10 mounds inside the circle to form a ring. 5.Bake 40 minutes or until golden brown. Turn oven off and let cake remain in the oven for 15 minutes more. Remove cake from oven and cool on wire rack. 6.When the cake is cool use a long serrated knife to slice it in half horizontally. 1.Mix the pudding mix with the milk. 2.In a separate bowl combine the heavy or whipping cream with the vanilla and powdered sugar. Whip together until thickened. 3.Fold the whipped cream mixture into the pudding. 4. Spread the filling evenly on the bottom layer of the cake then replace the top. Refrigerate while getting the glaze ready. 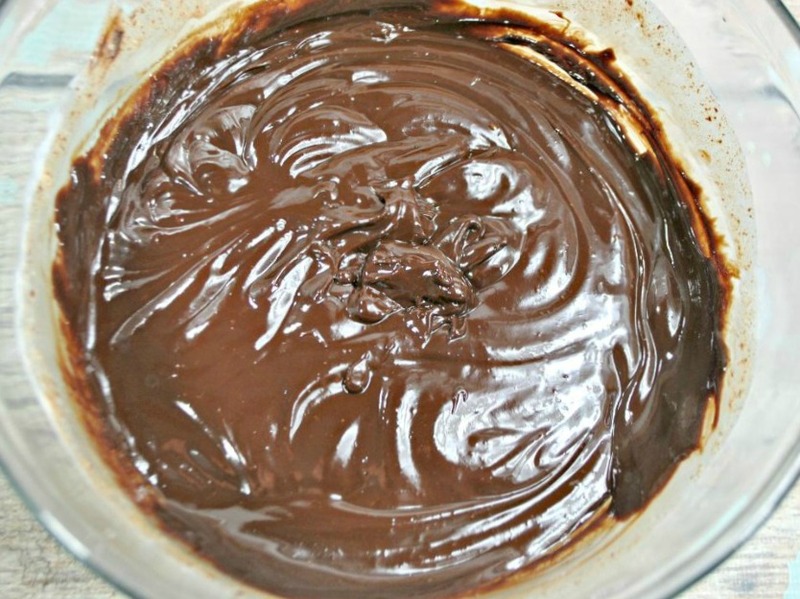 1.In a double boiler heat the chocolate, butter, milk and corn syrup. Stir until smooth. 10.Spread the glaze on top and serve.